When connecting to the Internet, speed, performance and redundancy are paramount. That's why you want our premium network. We offer direct feeds from three tier 1 carriers and optimize for performance, not the lowest cost. With our simple network map connecting you to state-of-the-art equipment, we'll get you as close to the cloud as possible, with the utmost in reliability and redundancy. And you'll have all the speed you expect - guaranteed - without latency or packet loss, thanks to our Gigabit Ethernet connections and Internap Flow Control Platform (FCP). Some providers take liberties when describing their carriers and whether their network offers border gateway protocol (BGP). We use Gigabit Ethernet connections from Internap, Time Warner and Level3 - we don't push traffic to low-end providers. And, each network has its own entrance to the facility. Our network provides the best of all worlds: BGP to support multiple providers, enhanced by the Internap 5200 flow control platform. 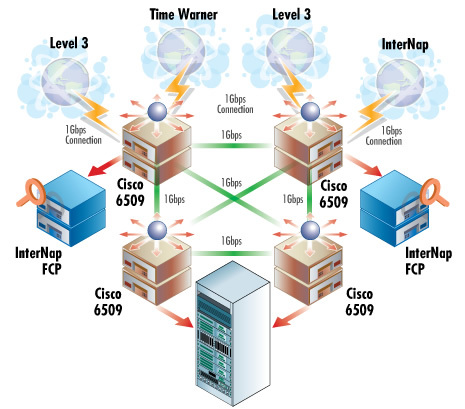 Forget about the shortest or theoretical best route - our Internap FCP appliance definitively identifies the fastest route for your data. If it senses any latency or packet loss in the chosen direction, it reroutes around it. And, it won't send traffic on a long, circuitous cross-country route just to avoid AS hops. With diverse entrances and FCP, our network sends traffic down the smartest path. You'll always get 100 percent of the bandwidth you buy. Sign up for a 10 Mbps plan burstable to 100 Mbps, and you'll always be able to burst to 100Mbps. Why should you have to pay for 20Mbps in hopes of getting 10Mbps? You don't have to accept getting less than what you purchase. Ours is an unparalleled data center environment built for security, connectivity, redundancy and resilience. Benefit from unlimited power and helpful employees who work on-site around the clock. Our state-of-the-art facility offers 28,000 square feet of ground-level floor space, plus the room and flexibility to support our clients' growth. PowerWare and Leibert UPS systems operate independently to provide true redundancy. Plus, staff on-site 24/7/365 walks through the facility and checks equipment performance. We're located in a single-level, single-tenant industrial building on one of the most fiber-rich routes in Dallas, Texas. So you get an accommodating, fully powered facility and convenient 24-hour access to fit your schedule.